Within the field of paranormal research there is a lot of focus on human spirits, ghosts and hauntings. Animals sometimes get a passing mention. However, when we delve deeper into the legends and stories of supernatural animals, it’s surprising how many reports there are. These encounters, relating to non-human spirits, are fascinating, at times puzzling and often frightening. In addition, the ghostly encounters include not only our common animals such as dogs, cats, horses, birds and so on - many people also claim to have observed creatures that are often believed to be demonic in nature. 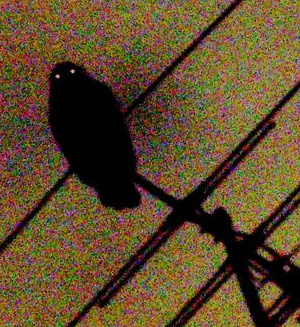 Some of the most curious supernatural cases relate to birds. There’s a wealth of folklore written about our feathered friends from all over the world. Here are just a couple of 'bird' hauntings that should help to get the goose bumps rising! The Punch Bowl Inn has a long association with the paranormal. At this particular hostelry there is an alleged haunting of a demonic black bird - thought to be a cockerel - that mysteriously appeared after the death of a local minister. Many claim that the demonic bird – that’s believed to have attacked people - is the soul of this angry man of the church. Legend states that he died after falling down his cellar steps. There are stories however, that it wasn’t an accident but murder. Rumours spread that the curate of the parish was in love with the minister's beautiful wife and so murdered his superior. Knowing this, the angry spirit of the minister is not at peace and returns in the shape of a bird. The most curious thing about this story is why the minister should have chosen the form of a bird? There is no doubt that the mighty Hapsburg dynasty was plagued by ill fortune - from its early beginnings centuries ago up until the beginning of the 20th. The source for their ill luck is alleged to relate to the killing of thousands of ravens. This cruel act was carried out in a nesting sanctuary. The sanctuary was set up by one of the founding members of the family - thought to be Gontran-de-Riche, Count of Altenbourg. The nesting tower was erected in gratitude to the birds that had saved his life from a group of vultures. 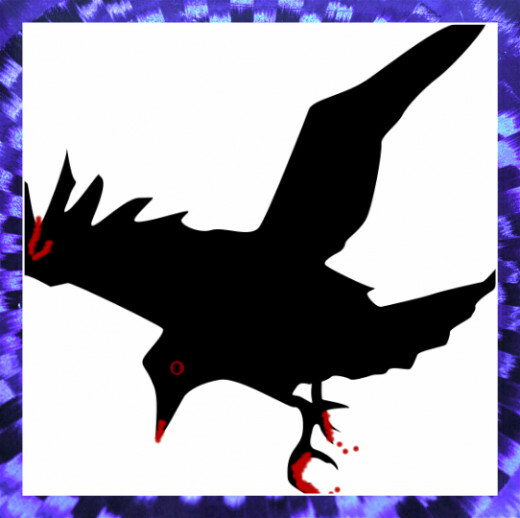 When the massacre of the ravens occurred - about a 100 or so years after the Count of Altenbourg founded the nesting tower - it is said that the Hapsburgs became cursed and haunted by supernatural ravens called turnfalkens. The stories tell how these ravens suddenly appeared mysteriously at the Hapsburg's castles. The family would then know that one of them was about to die. In addition, the ravens were often accompanied by a white female ghost, alleged to be wraith-like in appearance. Her presence was also held to spell doom for the family. It is believed that during the execution of Marie Antoinette - who was a Hapsburg - the turnfalkan followed her procession from the jail where she was held, to the guillotine. After she was decapitated it’s alleged that large numbers of ravens flew and screeched over the execution site. This creepy event has allegedly been repeated just prior to the deaths of other Hapsburg family members. Animal hauntings, although not as widespread as the human variety, are well documented. The most common animals to be encountered are dogs, cats, birds and horses but many other species have also been recorded. Here are just a few of the many thousands of spirit animals that have been witnessed over the years. One of the most famous pilots of World War II is of course Wing Commander Guy Gibson. However, just as celebrated was his black Labrador dog. 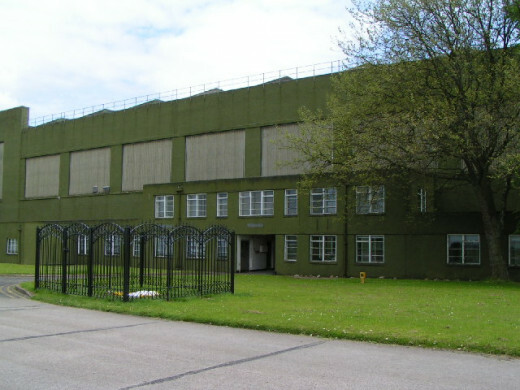 The dog was really a mascot for the RAF base during the war years, particularly for the Wing Commander's own squadron - 617 squadron. 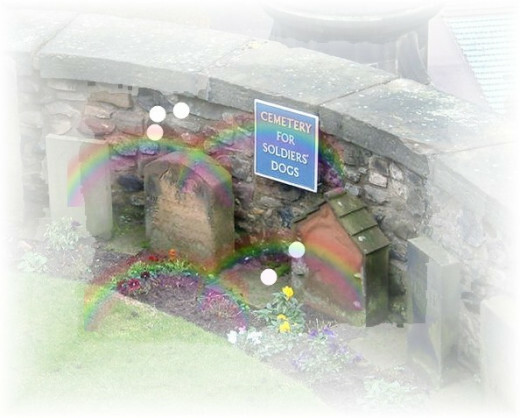 The dog was cared for by everyone not just Guy Gibson himself. It was a tragedy when the dog was accidentally killed on the main road outside the base, just prior to the famous 'Dam Busters' raid. Although Gibson was obviously distressed over the loss of his pet he kept its death secret so as not to demoralise his team. However, after the dog's death, throughout the war years and beyond, the friendly black Labrador was spotted by many people making its usual way, tail wagging, throughout the RAF base. The dog was not transparent, but looked solid, before it would simply vanish into thin air. A nurse related this story of a patient she had once cared for who was terminally ill.
Just before the patient’s death he was moved back to his beloved home. His pet dog, called Pepper, had been given to a family 10 miles away as the frail owner could no longer look after him. The nurse related that just minutes before her patient died, the room suddenly went very cold. She then heard him say, “Come on Pepper, time to go”. The patient died about two minutes later. A few minutes after this, a family friend telephoned to say that the patient's pet dog Pepper had died about five minutes previously. Did the dog, which may have died due to missing his owner, come back to his home in order to be with his human companion in the afterlife? There are many hauntings that involve more unusual pets. Drumlanrig Castle was reported to be haunted by not only human ghosts but also by a monkey or ape. In accounts and letters dating from the 1700's there are descriptions of an area of the castle known as the 'haunted room' or the 'yellow monkey room'. From the dates of these letters onwards there have been numerous accounts of a monkey-like creature being seen moving around the castle corridors. 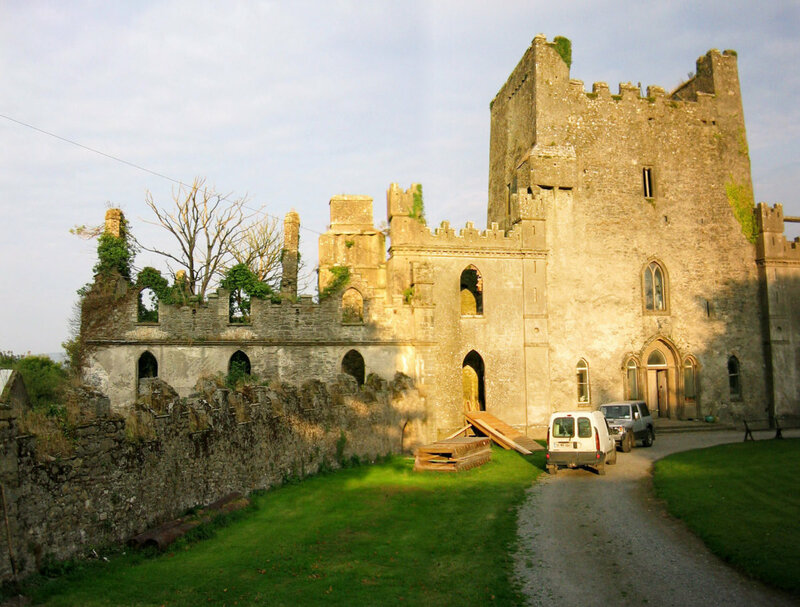 During World War I the castle was used as a military hospital. The spirit of the monkey was encountered by a nurse who was sleeping within the haunted room. She was so terrified by the apparition that she resigned the next day. 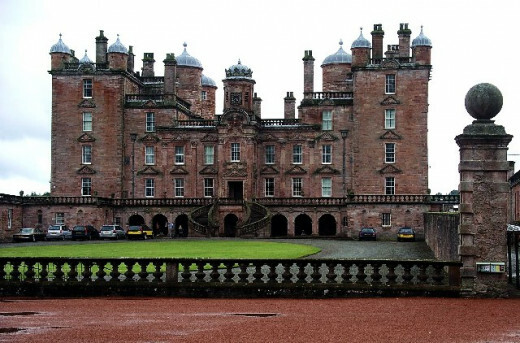 Drumlanrig is still one of the holdings of the Duke of Buccleuch and many members of his family have also had ghostly encounters with this strange pet. In addition it may seem odd that an animal not native to Scotland should be haunting a Scottish Castle. However, in days gone by, it was the fashion to have exotic pets from distant lands about your home. 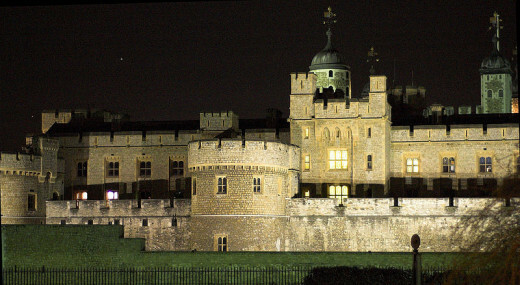 The Tower of London, London, England. There are a number of animal ghosts that have been reported over the centuries within the formidable Tower of London. It might seem strange that a fortress such as the Tower should have animal ghosts. However, in the past, this haunted monument held a menagerie of animals for entertainment purposes. One of the animal ghosts encountered is that of a large bear. This apparition was so frightening that it's said to have caused the death of a sentry on guard duty in January of either 1815 or 1816. When this unfortunate man saw the apparition it was so life-like that he jabbed his bayonet at it. However, the knife went through the animal and jammed in a wooden door on the other side. He was found by colleagues in a collapsed, frightened state. Nevertheless, he was able to relate his story that was confirmed by another soldier on duty at the same time. Sadly, the terrified sentry is reported to have died of shock a day or so after the incident. The Paranormal Research & Investigation HandBook: Ghost Hunting, Associations, Information, Hints & Tips. Not So Nice Kitty Cats? Most of the hauntings involving lovable pets are warm and benign as you would expect. However, in the following cases, we have accounts of some kitties that were not friendly at all. When restoration work was being carried out on the house in the 1960s the workmen complained of overwhelming feelings of being watched. After a time it was not only uncomfortable sensations the workmen experienced, in addition, the apparition of a black cat started to manifest. This was no ordinary cat however, being described as very large - about the size of a Collie. The phenomenon developed further when noises in the forms of growls were also heard. The owner of the house -artist Margaret O'Brian - was very sceptical about the claims until one day she too saw the ghostly cat. The house was subsequently exorcised but this did not work entirely. The apparition continued to be seen for some time after the cleansing. The sightings finally grew less especially after renovation work had stopped. St. Michael's Church in Rossington is the burial place of James Boswell who spent a lot of time, like Robin Hood, living in Sherwood Forest helping travellers and gypsies. He was even granted the official title of King of the Gypsies. It is said his grave was opened up so that his black cat could be buried with him, the animal having died just a few months after its owner. 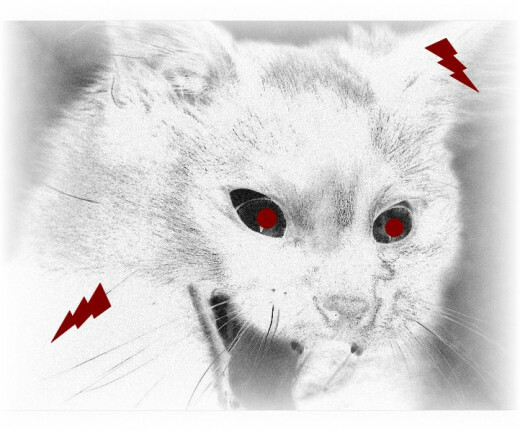 The spirit of the cat roams around the area - although the exact location of the grave is now lost. When the apparition makes itself known, noises are heard first. 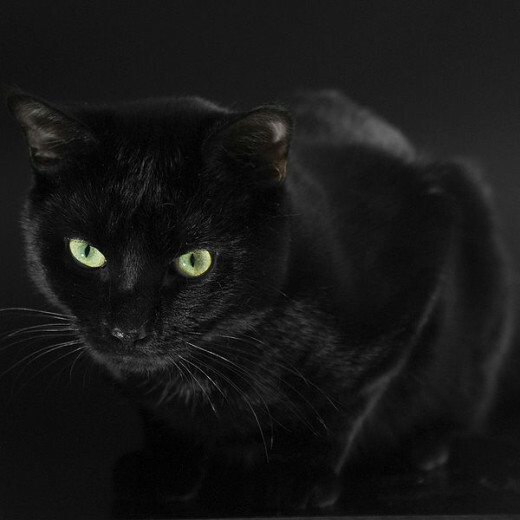 The cat is said to hiss and snarl at witnesses, just prior to the appearance of a shadowy shape, that transforms itself into a black or silhouette of a cat. In the above accounts we notice that the cats didn't seem all that friendly. However, it should be remembered that cats can be very protective both of their owners and the homes they occupy. It’s possible that these 'kitties' were just guarding their territory against perceived intruders. The physical or spiritual form doesn't seem to matter to cats - they still continue to protect what they regard as theirs! Do you believe that all animals have a spirit form just like humans? Yes I do believe they have a spirit form. They might do but I'm not too sure. No I don't think animals do have a spirit form. There are a surprising number of ghost horse encounters. They can take many forms such as the ghostly carriages drawn by spirit horses that are sometimes headless. Many cases also relate to 'white horses' in particular. In addition to the animal being seen, we also have the phantom lone rider with their horse, who vanishes as mysteriously as they appear. These cases are so numerous that they could fill a book, so I've chosen a small sample of reports that are fairly typical, to illustrate this phenomena. There is not one ghostly horse haunting Bramham Park but a group. Having said this there are many more accounts of the horses being heard rather than seen. However, observers who’ve had visual contact, describe the horses as being unusually large and very light in colour. The manes are very long and flowing as is their tales. What is more interesting is that they appear solid and no one has realised that anything was unusual until the horses suddenly vanish without trace. 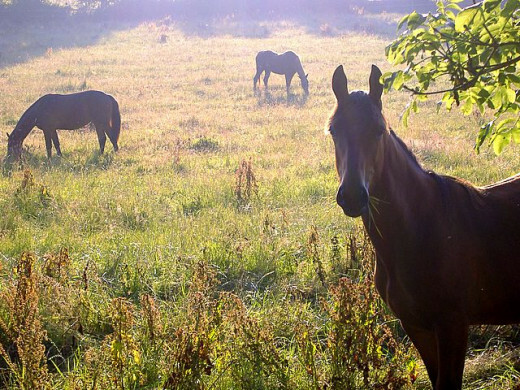 Some believe that the horses are related to the battle of Bramham Moor that took place in 1408. 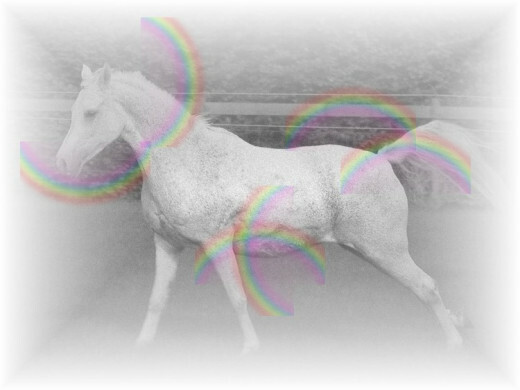 This spiritual white horse has been seen on numerous occasions galloping over fields. The area in question lies close to the site of the Battle of Edgehill of 1642. This was of course the time of the English Civil War and there are a couple of theories about who the horse might have belonged to. Some accounts suggest that the animal belonged to Prince Rupert. However, others propose that the horse's owner was a Captain Kingsmill who was slain on the battlefield. Of course neither of these theories need be correct and it certainly remains an enigma as to where the horse is going or who it belonged to. What witnesses do say is that the animal appears as solid as any flesh and blood horse and nothing seems unusual until it disappears into thin air. Welsh Ghost Horse - Colybe Bay, Wales. Wales is rich with mythology and ghosts. Among the stories of phantoms and spirits there are a number involving animals and horses in particular. The following account is one that has been witnessed on a few occasions and remains a mystery today. Driving along the small back roads, drivers have had to slam on their brakes and brace for impact as a huge, white horse appears from over a hedge and crosses in front of the vehicle. The horse is so large that it fills the windscreen. But just as a collision is expected the horse vanishes without trace. Interestingly, this particular ghost horse always seems to be encountered early in the morning rather than any other time of day. I hope you've enjoyed this article about supernatural animals and if you have any of your own stories then please share them with us in the comments section. Hey MT! Lovely to hear from you. LOL! Take heart from the fact that these supernatural creepies are very rare. Persoanlly though, I think I'd rather stick with a good classic ghost like a white lady rather than anything more bizarre! Many thanks for the lovely comment, glad that you enjoyed the hub and hope your weekend is a a great one too! My goodness Seeker-This research must have taken some time for you but so worth it. Although it was a lot to read, I was captivated from beginning to end. Yikes, night is just beginning to fall here in Minnesota and I have the creepies after reading this haunting assortment of stories. Your an incredible writer Seeker and I can't wait to read more from you. Have a great weekend. Hi to you tlw! Glad that you enjoyed the hub. I have to say I had lots of fun writing this one and although I'm sure many people might find some of the accounts far-fetched, they have been witnessed so many times by so many credible observors that it proves our world is indeed much stranger than any fictional story that might be created. Many thanks again for the nice comment - it's always a pleasure to hear from you. Voted up and all across but funny. Excellent article Seeker7! Very well researched. I always watch "Haunting" on the Animal Planet Channel. My wife and I have had enough experiences to know they do in fact exist so we are always watching shows to learn about them. I enjoy reading paranormal stories and learning what other experiences people have. There is a heap of great information in here and you really have created a class "A" article Seeker7. Avery good job indeed. Many thanks for the visit and the comment - glad you enjoyed the hub! Just read of few of these stories to my sister...good job! Glad that you enjoyed the hub and if any part of it inspires you to write more of your wonderful poetry then I will be delighted!! I agree that beasts are definitely more scary when viewed in a supernatural light. The 'Sigbin' sounds really fascinating and very scary! Many thanks once more for leaving such a nice and very interesting comment + the vote up! Really appreciated! All beast becomes really frightening and scary when taken as a subject of supernatural intercessions. In our country the same kinds of animals are common such big birds, dogs horses and "Sigbin" something not really certain but was said to look like a kangaroo which leaps backwards when it moves. Great idea of sharing this one seeker7. You really have great topics to share. 1 vote up and interesting for this. Well thank you very much for such a lovely comment! You've actually made me blush and that hasn't happened for many a moon! LOL! Really glad that you enjoyed the hub and thanks for taking the time to visit and leave a commnet - much appreciated! Seeker7 you are simply wonderful, the presentation is well laid out. kudos. Lovely to hear from you and thank you so much for leaving such a nice comment - much appreciated. What would we do without our animals? And what a dull place this earth would be if we didn't have them! They remind us of the true spirit of life! Many thanks again for visiting and leaving a comment. A very interesting piece. I didn't know that about the horses and the dogs. But thank you so much for writing about them. You are also right about another thing--animals are indeed the purest of souls. Animals - to me - are the purest of souls. The do nothing out of malice, selfishness or hate. What they do is ordained by Mother Nature and nothing else. So, created in such a beautful fashion it's only natural, that they are sensitive in so many different ways. We can learn so much from animals, if we take the time to look. And yes, you are right - we are all connected. Many thanks for your really interesting comment - I enjoyed reading this! You know, you make great points. Animals have feelings just as us. I have always heard that animals have that ability and I would agree. We seem to all be connected. Think about how many people that have reported such findings. Very well written article. Hi Nell! - What a fabulous story about your Mum and her wonderful cat Simba! Animals have such extraordinary senses and abilities that we only know a little about. I think as well when paranormal activity is going on, they are the most honest of witnesses! Many thanks for stopping by, it's always great to hear from you and I love reading your stories and comments! Hi,another fascinating hub! its true that it can be residual energy, but even so, that on its own is amazing. I do remember reading about the RAF dog, what a lovely story! my mum was in hospital a few years ago, and we had a cat that she worshiped. one afternoon,it was asleep on the floor by the fireplace and we couldn't wake him up. panicking we did everything we could, but he was asleep. we knew he was alive, so we left him but felt very unhappy about it. about an hour later, we went over to see my mum. she was wide awake and smiling, when we asked why she was so happy she said, 'Simba was here with me, I woke up and found myself stroking him, and no I wasn't still groggy from the anasthetic, I even saw him, too, for a few seconds!' it was the exact time we couldn't wake up the cat! Hi Peg, lovely to hear from you and glad that you enjoyed the hub! The black dog phenomena is very interesting, but I think that the strangest part about it, is the number of very credible witnesses who have reported seeing this phenomena! Another thing that interests me is how old this type of encounter is. Some ghosts etc. seem to fade away over the centuries, but our strange black dogs just seem to keep on going. OH! give your dog a hug and a kiss from me - I love labradors of all colours. They are so loving and expect very little in return, well, with one exception - food! food and more food! LOL! Many thanks for the visit and I really enjoyed reading your comment. This was a fascinating read and the illustrations you chose to use were perfect. The black dog phenomenon was really interesting to me as we recently adopted a black Labrador. Of our many dogs over the years he demonstrates an intensity of affection that I hope carries beyond this life. Remember "The Grim" in the Harry Potter Series? Lovely to hear from you again and glad once more that you enjoyed the hub. And thank you for the compliments, especially coming from a writer of your ability. I think with Ben, as with any other spirit - human or animal - they do tend to react to our emotions when they first cross over - especially our grief. Once we settle down and begin to heal, then their energy begins to settle down into a proper spiritual vibration and that usually means that we sense them less frequently. But it's always a great comfort to know that they are still around whether we sense them strongly or not. Another great hub, I love it. I believe our beloved dog Ben is still with us although I am not as aware of him as much as I used to be. Ghost horses sound fascinating, I have read about black dogs before but not so much about the horses. I loved every word of your writing again. Lovely to hear from you and many thanks for stopping by. I'm glad that you enjoyed the hub and found it interesting. The account about your Grandmother is fascinating. The dogs sounds very similar to the Scots and Irish Banshee. The dog was acting in the same kind of way by announcing a death before it actually occurs. It's no surprise that the family were scared. Germany is a wonderful place for not only beauty of scenery, but for folklore and legend. I might be wrong, but I think, from what I remember, Germany has some of the oldest legends and folktales in Europe. Many thanks again for your comment and for sharing such a great story about your Grandmother. I loved this ghost animal hub - a change from the usual human ghost. My grandmother was from Germany and, though I never met her (she died before I was born) my mother said she had a lot of ghostly animal tales brought from the old country. She had one story where a strange dog comes to howl outside the house where a person is about to die. Oddly enough, shortly before my grandmother died, this happened and scared the rest of the family. My grandfather chased the dog away several times. Hi Kitty - as always it's a real pleasure to hear from you and I always value your input to any topic. I think we are all playing catch-up and never have enough time. I'm the same at the moment - I'm looking after my Dad who has been unwell - so I've haven't been on that often and need to catch up with other hubbers - including your good self of course. I haven't noticed the Blue Dog Hill hub I will need to read that soon, it sounds fascinating!! The ghost mule also sounds so interesting and goes to show that it's not only cats and dogs that survive into spirit. As for your own experiences - this sounds awesome! I have had vague experiences with my own pet dogs, but nothing to what I would have really liked. Although in the dream-state the experiences are much more vivid. Thank you so much Kitty for the praise and vote up. From a wonderful writer such as yourself this really means an awful lot to me! Bright Blessings! I've been wanting to comment on this hub so badly but I never have time! This was AWESOME AWESOME AWESOME. I have had my own experiences with a ghost cat before...and there's tales of a ghost mule at the Pennsylvania State University (US). I've also written a hub about a phantom dog of Blue Dog Hill in the state of Maryland. Ghosts interest me, just as they do you, and this hub was absolutely phenomenal and well-written, but what else can we expect from you, my friend? VOTED UP AND AWESOME. 1. Hi Lucky Cats - it is always a sheer pleasure to hear from you and your comments have really made me blush!!! Thank you so much and coming from a wonderful writer and Hub Pages contributer like yourself, this does mean a lot to me!! I'm glad that you enjoyed the hub and a big thank you for the vote up. 2. Hi Movie Master - lovely to hear from you and for leaving a comment - I always enjoy your input whether in your hubs or the comments. I'm really glad that you enjoyed the hub - especially Francis Brown. I laughed my a**** off the first time I read that! Serves him right!! As you may know I love dogs and other animals, but like you I did find the Black Dogs very freaky. They are obviously in the shape of a dog, but don't act like 'man's best friend' - very eerie indeed. Many thanks for stopping by and for the vote up - it really is appreciated!! I loved the story about Francis Brown, he was frightened into staying sober the rest of his life! I find the black dog phenomena quite scary, and the ghost horses fasinating! Fantastic hub, thanks for sharing and voting up. Hi Seeker...well, you really do your research and share with your readers such incredible deep and thorough information about ANY subject you choose to write. This is packed with amazing folk lore and legend...with lots of "proof" to back up the stories. I am always interested in the supernatural, ethereal, psychic and peculiar. Your hub has satisfied all of these. Accompanied with beautiful pictures and historical as well as geographical information; your writing is fabulously professional. Love it! Up awesome useful interesting and should be an "amazing," too. Lovely to hear from you. Many thanks for the comment and the vote up - it is really appeciated. Thank you. What a good hub Gave it a up vote. 1. Hi catgypsy, lovely to hear from you and glad that you enjoyed the hub. Many thanks for the visit. 2. Hi Gypsy Rose Lee, lovely to hear from you. That is fascinating about your cat Cha-Cha. What a comfort that must be to know that she isn't that far away from you and still loving you as she did when in the physical life!!! It is a lovely thought that we will meet up with all our pets at some time in the future. Wow I just love anything to do with the paranormal. The pictures were hsunting. When my cat Cha-Cha died two years ago for quite a while I felt her brush against me and heard her jumping in through the window and from various pieces of furniture. It was comforting to know she was still with us but sad because we couldn't see her. Now we have a new cat Sid and I know Cha-Cha doesn't hold that against us because even though now it happens rarely there are times her spirit still visits us. It was long but it certainly captured my attention. I was born and bred in York where there are many legends of ghosts. I have experienced scary ghostly happenings and have now decided I will write a hub over the next few days. It's always great to hear from you and I'm glad that you enjoyed the hub. Yorkshire is not only one of the most beautiful places - I've visited a couple of times, although many years ago now - but the history and legends are stunning. To make it all just about perfect I think Yorkshire folks are the best - down to earth, but great fun!! I think the ghost horses of Bramham are quite well known although like you and me, ufortunately, we've never had the privledge of seeing them. I think it would be a stunning spectacle!!!! Voted this one WAY UP - awesome! 1. Hi Alastar - LOL!! I always do enjoy your comments - I hadn't heard of Charlotte Cordy's head blushing?? How freaky is that! I hope her dog didn't run away with her head like Sir Vaughn's?? I do admit I love writing these hubs. Most of course is probably folktales, legend being built up etc. But probably most have a spark of truth somewhere in their beginnings. I believe in the spirit world full stop. but what fascinates me is how many of these legends are built up over the centuries to extraordinary proportions - there is probably a lot of psychology within the stories somewhere! And you have intrigued me with the 'unexpected answer' for some of the phenomena. I really look forward to reading that. That is fascinating about your 'red-eyed canine'? That would have scared me I think, despite the fact I adore dogs!! 2. Hi Serious Nuts - it's always great to hear from you and I'm glad that you enjoyed the hub. I agree with you 100% - religions who state that animals don't have spirits or souls don't know what they're talking about. If you're alive in the physical world you have a spirit and a soul irrespective of what species you are. Death is not religious, it's life. I'm like you I found the story of Pepper very moving - I think this story could easily have been put into the next hub on animal/pet spirits but I left it in as I thought it added something very sweet to a hub that can be a bit freaky at times. Many thanks for your comments, as said before, it's always great to hear from you and I always enjoy your input. 3. Hi Rosemay50, many thanks for stopping by and really glad that you enjoyed the hub. It was - as usual- longish, so I appreciate you sticking around for the finish!LOL!! Wow what an impressive hub. I enjoyed reading every word. Hi Seeker7, this is a very interesting hub. The story about Pepper is very moving. It seems that animals do have souls or spirits, despite the beliefs by some religions that they don't. No one has been to the afterlife so this can't really be proven yet. However, sightings of these supernatural creatures may prove something..
Ah, a supernatural article to savor slowly Seeker7. Just when you thought you'd read everything on the neck slicing of Marie Antoinette here comes the Ravens. Eerier than Charlotte Corday's severed head blushing after being slapped by the asst. executioner. 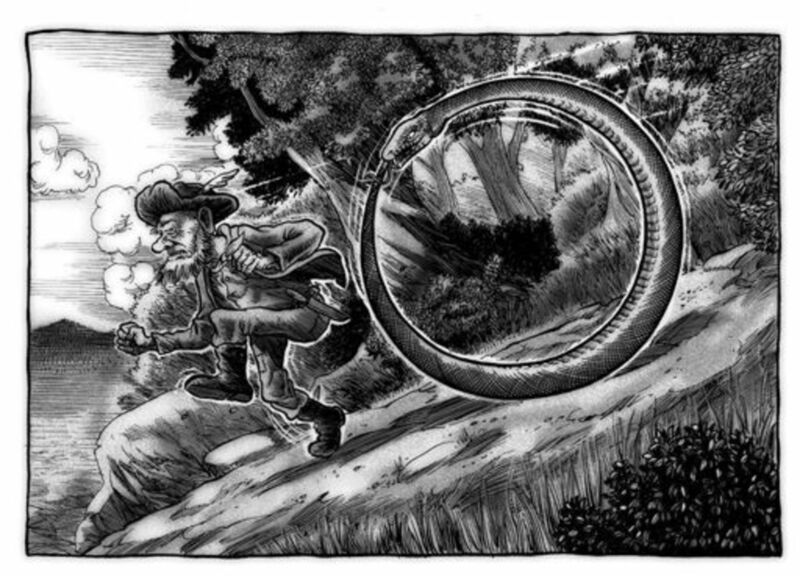 Derby 1723 reminded of The Legend of Sleepy Hollow in a way. Let me stop here a sec and say this is an extraordinarily good article. New and exciting info, written & formatted well, great pics. The Black Dog phenomena is particularly enlightening for me. The crossroads ghost dogs are rather common over here as well. Having experienced a red-eyed canine apparition in a small cave once, its very pleasing to read of all these new legends and occurrences on supernatural animals. I agree with your conclusion, however, another area I'm researching now has opened up the possibility of an unexpected answer for at least some of these haunting unknowns.